Spirituality is that human attitude which disposes a human being to be preoccupied with, to have as priorities and to live by in daily life, those ideals, beliefs, standards, principles and values, which all men and women of goodwill acknowledge as good and important for the happiness and welfare of their fellow human beings, and the best preservation of the environment and the world which we share with all other living beings. As applied in practice, ceremonies reinforce, transmit and express these spiritual values, however we understand them. Even though many people think that “Spirituality” is the conjuring up of mystical states, ecstatic feelings and heightened levels of metaphysical existence, the great spiritual guides of almost every eminent religious and philosophical tradition do not agree. When you cut to the chase, it is down to how you live, how you treat yourself, how you treat others, and how you treat your world. In this Module we touch on the Spiritualities which the celebrant would do well to cultivate and know about. We have divided these into three. Personal spirituality – celebrancy is the kind of vocation which calls on one to be the best kind of person one can be. Celebrant Spirituality – focuses on the virtues, habits and attitudes a celebrant should cultivate to do their task well. Cultural Spirituality – this involves a level of education regarding the many religious and non-religious streams of belief which individuals, in a multicultural society, carry within themselves. The clients of celebrants come from every stream of belief and unbelief. A celebrant should have and a basic understanding of these streams of human thought and respect the contribution made by them to humankind. Into the twenty-first century, many citizens have little or no formal religious allegiance, however they still have some form of spirituality. These people will look to civil celebrants to ‘read’ their needs at the time of significant events, to suggest and/or provide the words and the symbols which express their own spiritual yearnings, ideals, values and convictions in the ceremonies they require. Approaches to secular spirituality, and its difference to various religious spiritualities. A range of spiritual and religious traditions will be touched upon. In a multicultural society it is important for a celebrant to be conversant with the various traditions of their clients and the client’s religion. the distinction between ‘religion’ and ‘spirituality‘; the ways in which people can have a spirituality independent of the Church, Mosque or Temple; the main sources from which spiritual enrichment can be derived. the power and importance of traditions for good or ill, and how they can be incorporated into a secular spirituality. The different understandings of secular and religious persons with regard to powerful emotional experiences and to the great passages of life and death. The difference, if any, between artistic and religious sentiment and artistic and religious ecstasy. How secular ideals and values are expressed, reinforced and transmitted in civil ceremonies. What do we mean by this? Is not a celebrant totally neutral? Here we consider the personal qualities and ideals which should be developed by the celebrant for their own personal enrichment and for the proper response to their work. For example, a celebrant should be punctual, honest, sensitive, tolerant, law-abiding, non-judgmental, empathetic, an active listener and so on. Religious people would call these virtues. So,how do we develop these qualities and ideals? Learning journal – This journal is particularly important for the study of this module which, obviously, is intimately connected to human life and behaviour. Students should be aware this is a vast and rich subject area to which this module should be considered only as a practical introduction. 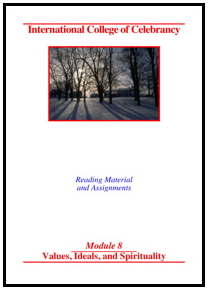 Research questions – on selected written material provided with the module manual, books, DVDs and website links. Fieldwork – structured interviews with two religious believers and two non-believers. If possible they should be celebrants who are aware of, and have some understanding of their own spirituality. Reports are then to be written. All manuals and DVDs are provided, including “Ceremonies and Celebrations” if not previously provided and “God – The Interview” by Terry Lane, and will be made available immediately, once the College receives full payment for the module. If the module manuals, books, DVDs and other items are downloaded from our website a discount will apply. Otherwise the items will be sent by post, airmail where necessary. Transferring any material belonging to the College to a third party without prior permission is unethical and strictly forbidden.